I probably talked a little too much (or a lot too much) in Sunday school class today. I may have even gotten on a few nerves. It was difficult not to. The sermon was on Exodus 19:1-25 which is Pastor Randy’s introduction to a sermon series on the Ten Commandments and how they apply to the Church today. Before even getting to the Ten Commandments, he’s going to spend separate sermons on Deuteronomy 5:1-5; 22-23, 1 Timothy 1:8-11, and Galatians 3:1-14. After that, he’ll spend one sermon on each of the Ten Words (Aseret ha-Dibrot). I had the opportunity to speak with Pastor before service began. He knew I’d be particularly interested in these sermons and also knows the points where I’m likely to disagree. That’s OK since there are other areas where I do agree, one of which is that most Christians really need to hear more about “the Law” and how not only was it valuable in ancient days, but that it is valuable and relevant for not only present day Jews, but all modern believers in Jesus Christ. I won’t spend a lot of time on his sermon, but he did reference a Christian children’s song that goes Every promise in the book is mine, every chapter, every verse, every line. Happily he said that these lyrics are not true and that the Bible must be studied carefully to determine which of the promises can be applied to the Gentile Christian. He also said “we (the Church) are not Israel,” to which I wholeheartedly agree. I actually ran out of room on the sheet of paper given out before services to take notes on the sermon. What Randy explained was worth a lot of ink to preserve his thoughts. Pastor got into such detail that he ran out of time, only getting to verse nine out of twenty-five, so we’ll pick it up starting with verse ten next Sunday. I told Randy that I didn’t feel sorry for him (in the sense that we don’t always see eye-to-eye) since he is a careful, honest, and thorough researcher and instructor. My Sunday school teacher on the other hand, I do feel sorry for. I didn’t get a chance to talk with teacher before class began but given the topic and the fact that he knows my areas of emphasis, he should have expected my “active participation.” It didn’t help that not a lot of other people in class were speaking up much. Again, like last week, we had new people in class, so I also felt a little sorry for them since I’m not a typical Sunday school student. The “sign” given to Moses in Ex. 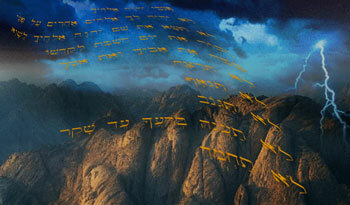 3:12 is fulfilled here: he has returned to the “mountain of God.” The presence of the “if” in Ex. 19:5 did not pave the way for Israel’s decline from grace into the law. “Decline from grace into the law?” Since when did the two become mutually exclusive? I’m not sure that’s what Kaiser was saying and teacher did try hard to emphasize that the grace shown Abraham (Genesis 15) ran parallel to the giving of the Law at Sinai. That’s the Covenant. The Torah, all of the commandments, statues, and ordinances, are the conditions of the Covenant, the things the Israelites agreed to obey to uphold their end of the Covenant. These are just about the same words we see in Exodus 19 where God describes who the Children of Israel are to Him in the Covenant, but Peter is addressing a non-Jewish audience. Pastor said that in the body of Christ, it is not the peoples but the people of God, singular. But since he also said that the Church is not Israel and recognizes Jews in the Church (presumably) as “Israel,” then there are distinctions, though I recognize more distinctiveness between believing Jews and Gentiles than he does. And yet, it is the ekklesia (assembly) who are “chosen,” “a royal priesthood,” “a holy nation,” a possession” (Am Segulah — a treasured, splendorous people) according to Peter. Israel became a people and a nation before God at Sinai (and according to Jeremiah 31:35-37 they will never stop being a people before God) and when the people of the nations become disciples of the Jewish Messiah through faith, we too become “chosen” and “treasured” as grafted into the root. Teacher filtered the Exodus 19 experience through Romans 7, 8, and Galatians 3. I used some of the information from my Reflections on Romans series to head off the idea that the Torah in any sense could be “bad” or cause sin. This was surprisingly acceptable to teacher but I have no idea what anyone else was thinking. Pastor Bill was in class, so if I’d said something too far out of line, you’d think he’d have brought it up. Like I said last week, it’s like they’re shooting all round the target and are just short of a bullseye as far as “getting it” in regards to the continuation of the Torah in Jewish lives. Teacher even mentioned Psalm 19 which is one of David’s strongest endorsements of the beauty of the Torah. And yet in past classes, teacher has also said how relieved he was that we Christians aren’t under the law, so some dissonance is happening somewhere. Obviously God expected that when Israel said “All that you have said we will do,” they would and actually could do it. The Torah is a delight. It always has been. Only human weakness and frailty make it difficult if not impossible for the Jewish people to be able to fulfill their vow before God. But while perfection in the performance of the mitzvot isn’t something that can reasonably be achieved, God’s plan of redemption through the New Covenant (Jeremiah 31, Ezekiel 36) will make it possible. Since we people of the nations, through a portion of the Abrahamic Covenant (Abraham 12:1-3, Galatians 3:15-16) solve the mystery of the Gospel (Ephesians 3:1-13) on how Gentiles can receive New Covenant blessings and yet not be of the House of Judah and the House of Israel, we also benefit from that redemptive plan. But if not for Israel and God’s promises to her, there would be no hope for us. I managed to get all that out in class but I don’t know if it made the impact I wanted it to. I think Pastor’s goal and mine for his sermon series are pretty much alike. I think we both want the people at church to see the Bible as one, big, unified book, and not a document that describes a “before” and “after” picture, or a bunch of different plans God had, trying out one after the other until he found one that would work. Pastor’s going to teach a class this Fall called “God’s Big Picture” where he presents the Bible as the single, overarching Word of God. I’d attend but I’ve spent over a year having almost weekly private conversations with him about these topics, so we both know where the other stands. I’d just serve as a speed bump to the other people who want to listen to Randy, but then again, maybe that’s what I’m doing in Sunday school, too. I came away from class feeling pretty flat and regretting that I spoke up so much. I was still holding myself back but there was so much I felt needed to be said. I realized that when I was responding to questions, I wasn’t really answering them, but then, I think that was because I didn’t agree with how the teacher organized his entire lesson. His “vision” of how to teach the material and mine are more than a little different. I guess I’ll have more than one shot at this, so next week when we delve into Deuteronomy, I’ll try again. Hopefully, God will help me become a more effective participant unless He doesn’t want me to speak up at all. But then again, what would be the point of going if I couldn’t participate because, and I’m sorry to put it this way, I believe I have a better handle on topics related to the Torah than my Sunday school teacher. Yeah, that sounds incredibly arrogant, even to me. So much for the month of Elul. Addendum: Monday, September 1st: If you read the comments below, you’ll see that several people pointed out my mistake regarding 1 Peter 2. The intended audience of the epistle is not a non-Jewish but rather a Jewish audience, thus we Gentile disciples of the Master cannot consider ourselves “a chosen race, a royal priesthood, a holy nation, a people for God’s own possession.” In retrospect, this actually strengthens my prior statements that the people of the nations called by our Master’s name cannot be Israel, since only they are referred to by the language from the Sinai Covenant. Who is Peter, apostle to the circumcised (or the Jews, see Gal 2) addressing at the beginning of the letter? How could Peter say to fellow Jews Once you were not a people, but now you are God’s people? I think I’m in agreement with “O” on this one, and that Kefa was actually invoking the Exodus language to take his readers’ perspective back to the period before Avraham when even Jews were not a people, when Avraham was called out of the darkness of Chaldean idolatry, and simultaneously to the period of the Exodus when they were called out of the darkness of Egyptian religious views (not to neglect the physical slavery) to become an actual nation and culture and civilization to be shaped by HaShem’s principles. Kefa’s letter takes on rather a different coloration if viewed through a parochial lens of being addressed to the Jewish segment of the ecclesia in the galut rather than as a “general letter” which is a common Christian description of it. How would the principles and exhortations and consolations within it be interpreted it were read by non-Jews as “somebody else’s mail” that was not addressed to them? It is somewhat disconcerting for some to deal with the notion that you described your pastor as presenting, with respect to a presumably old familiar children’s song whose premise was not accurate. I fully agree with Onesimus. I think that Peter’s letter is addressed to fellow Jews in the diaspora. @alfredo — It may be valid to distinguish between the periods before and after Sinai with respect to a “kingdom of priests and a holy nation”; but before Sinai Jews were still the people of HaShem’s covenant with Avraham and inheritors of those promises for land, descendants, and spiritual culture. So I will insist that the appellation of “G-d’s people” was applicable to the chosen lineage from Avraham through Yitzhak and Yacov, dis-including Avraham’s physical descendants through Ishmael and other children, as well as Esav’s descendants. Hmm. It would seem the consensus is heavily against me, which is OK. I made the mistake of taking the Sunday school class’s word for it without reading the larger context of Peter’s epistle. Mea culpa. @PL. Yes you are correct. My mistake. 17 So I tell you this, and insist on it in the Lord, that you must no longer live as the Gentiles do, in the FUTILITY of their thinking. 18 They are darkened in their understanding and separated from the life of God because of the IGNORANCE that is in them due to the hardening of their hearts. Notice that Paul and Peter link two key aspects of paganism associated with Gentiles: ignorance and futility. The Greek terms are “agnoia” and “mataios”. The other alternative is that this correlation is just a bizarre coincidence and in reality Peter believed that Judaism was a futile and ignorant way of life. I think that Peter is telling to fellow Jews living around gentiles to not live like them, but live like Jewish not in ignorance of what Jewish life means. Their ancestors might have been Jews that left Judaism long ago… that went after silver and gold handed out by pagan gentiles… I think that Peter is telling fellow Jews to do Teshuvah, and return to HaShem… just like Yeshua told fellow Jews in Israel. Hi James, here’s some input in regard to your question “How could Peter say to fellow Jews Once you were not a people, but now you are God’s people?” Our small Torah study group is studying Torah Club vol. 3 this year which looks at the Haftarah portion each week from the prophets. For parasha Bamidbar one of the Scriptures we studied was Hosea 2:1-22. Peter is quoting 2:1 (1:10 in English bibles) which does refer to Israel and his fellow Jews, whom I also think he is addressing. According to the Torah Club commentary the prophecy literally refers to the northern kingdom of Israel who Messiah will gather back to their land at the time of His coming. However, I believe Paul uses this same passage to imply that it includes gentile believers when he quotes it in Romans 9:24-26. I hope this helps. Great !!! Peter quoting Hosea 1:10 !!! The audience these encyclicals went to was mixed as Paul often affirms and evidenced by both Peter and Paul writing the same groups. That Peter was written only to a Jewish audience is patently false. Peter’s second letter’s opening sounds more general, even though it comes from “Shimon Petros” (the “Shimon” being his more particularly Jewish name), because it is addressed to those who received a faith like that of some implicit group that he represents (presumably fellow Jews), which suggests the intended recipients may be non-Jews. So… (tongue in cheek) does that mean I can tear that letter out of my Bible since (according to some) it isn’t addressed to me? Or, do I just use the old Christian mumbo jumbo of applying the ‘principles’ but not really laying hold of it? If we follow BE we can whittle the relevant verses for non-Jews down to a small tract and save a WHOLE lot of paper. 😉 The tree-huggers will be really happy! On the other hand, I think it is about finding out the proper way to read the Scriptures in the correct context and then, only then, try to apply the instructions and principles to our lives. Pete, you seem to have missed the entire point of Acts 15:21. It infers that non-Jewish disciples are expected to be learning Torah regularly, presumably in order to understand the four principles extracted from it which were just beforehand listed as the only obligations incumbent upon non-Jews. It would hardly be reasonable to talk of non-Jews tearing pages out of either the Tenakh or the apostolic teachings merely because only a relatively small portion was directed at them. Let’s not forget that “All scripture is … profitable …” (cif: 2Tim.3:16). If one were to neglect that principle, gentiles might as well ignore Rav Yeshua entirely, since he claimed that he was sent only to the lost sheep of the house of Israel (cif: Mt.15:24). Peter wrote his letters to a group of believers, to a “church” or “churches – it is highly unlikely that his intended recipients were solely Jewish or solely gentile; but given Peter’s ministry (Apostle to the Jews as Paul described him) and the way he addressed his first letter, he anticipated the INITIAL recipients (probably people of his acquaintance) would be from a Jewish background and it is possible that the groups he was addressing had a high proportion of Jewish believers. The opening of his second letter isn’t so specifically addressed – but to me it seems as if the greeting gives more acknowledgement to gentile believers among the churches to which he was writing. “To those who have obtained a faith of equal standing with ours by the righteousness of our God and Savior Jesus Christ”. I agree with the Pastor that the Christian Church is not Israel. But as for the Believers in Yehoshua, Jew or Gentile, we are the Son’s of G-d. We are also grafted in to the Vine of Israel, in place of some branches who were broken off. Are not all Believers part of Israel? 15 For if their casting Yeshua aside means reconciliation for the world, what will their accepting him mean? It will be life from the dead! 16 Now if the hallah offered as firstfruits is holy, so is the whole loaf. And if the root is holy, so are the branches. 18 then don’t boast as if you were better than the branches! However, if you do boast, remember that you are not supporting the root, the root is supporting you. 20 True, but so what? They were broken off because of their lack of trust. However, you keep your place only because of your trust. So don’t be arrogant; on the contrary, be terrified! 21 For if God did not spare the natural branches, he certainly won’t spare you! 22 So take a good look at God’s kindness and his severity: on the one hand, severity toward those who fell off; but, on the other hand, God’s kindness toward you — provided you maintain yourself in that kindness! Otherwise, you too will be cut off! 23 Moreover, the others, if they do not persist in their lack of trust, will be grafted in; because God is able to graft them back in. 24 For if you were cut out of what is by nature a wild olive tree and grafted, contrary to nature, into a cultivated olive tree, how much more will these natural branches be grafted back into their own olive tree! @Questor — You asked: “Are not all Believers part of Israel?” The answer, as I’ve stated here before, is quite simply: “No, they are not.” The olive tree described by Rav Shaul, into which non-Jews are grafted along with Jews who were there by nature, is not Israel — it is a community of faith, a community of those who place their trust in HaShem, His promises, and His redemptive processes. It is characteristically a Jewish olive tree, and at one time the only branches on it were Jewish ones — but wild non-Jewish branches can be grafted onto this tree of faith by means of their agreement to trust HaShem. These wild ones do not become Jews upon being grafted into faith, they do not become part of the people descended from Israel, they do not even become converts integrated into the peoplehood of Israel. Rather, they become partners with the people of Israel, and they obtain by means of free grace a number of the same kinds of blessings that come to Jews via the Torah covenant. Certainly the Torah should guide their sanctification and spiritual maturation, but conformity with it is not their responsibility as it is for Jews. The grafted-branches metaphor does not address finer details such as the process of conversion, where warranted, not does it really address or depict the process of growing in spiritual maturity for either natural or wild branches. It is merely a static picture of a multi-ethnic community of faith, and not of the processes by which grafting occurs, or how development progresses as nutrients are absorbed from the root (though its description mentions that this occurs). If Peter was addressing a Jewish audience and trying to get them to return to Torah then he wouldn’t say “the empty way of life handed down to you from your ancestors” but rather “return to the True way of life handed down to you from your ancestors.” Why impugn an entire chain of tradition if the problem were only a few recent links that had become Hellenized? @Peter: You know that children learn what their parents teach them… probably that generation of Jewish people didn’t suddenly strayed away from Torah. What if the ones who began their journey out of Israel were the ones who begun to live the empty way of life and adjusted their lives around pagan cultures? Didn’t that happen before to Israel? Haven’t you read in the Tanakh about “that” happening before? To: God’s chosen people, literally, “God’s elected ones,” meaning Israel, living as aliens in the Diaspora. Kefa directs his letter primarily to Jewish believers (including Jewish proselytes who later accepted Yeshua), since he was “an emissary to the Circumcised” (Ga 2:7-8). However, the spiritual content of his Gospel, salvation by trust (vv. 3-9), was identical with that of Shaʾul, the “emissary to the Gentiles” (Ga 2:6-9&NN). However, Gentiles who have not converted to Judaism but have trusted in the Jewish Messiah and thrown in their lot with the Jewish believers are counted along with them, since by their trust such Gentiles have been grafted into Israel (Ro 11:17-24, Ep 2:11-16). What the phrase does not mean is simply “the Church,” as opposed to “the Jews”; since the word “Diaspora” (Greek for “dispersion” from the Land of Israel) would then be inapplicable. Compare Yaʿakov’s similar greeting, “To: The Twelve Tribes in the Diaspora” (Ya 1:1&N). “A chosen people, the King’s cohanim, a holy nation, a people for God to possess (KJV “a peculiar people”). In the Tanakh these terms are applied to the Jewish people, Israel. Kefa applies them to the readers of his letter, who, according to 1:1N, are, firstly, Messianic Jews and, secondly, Messianic Gentiles who truly identify with them (compare Ro 1:16). Many Christian theologians have used this verse as evidence that the Church (the Christians) has replaced Israel (the Jews). If I am right about who the readers of this letter were, then these Christian theologians are wrong. Even if I am wrong about the readers, Replacement theology is inconsistent with Ro 11:17-26, Ep 2:11-22, and other references at Mt 5:5N. I would put it this way: Christians are indeed a chosen people, priests for the King, a holy “nation” (in a metaphorical sense), a people set aside for God to possess—not by way of superseding the Jews as God’s people, but by way of being joined to them by faith in the same God and in the Jewish Messiah. A so-called “Christian” who opposes or looks down on the Jews as merely God’s “former” people has missed the point altogether and is probably not a Christian at all. It’s clear this one spun in an unanticipated direction. I’ve been following the dialogue just enough to verify that each comment should be approved for public view but not beyond that. Been kind of busy these past couple of days. Will concentrate on the conversation soon and attempt to respond. Thanks. I decided to go back and read Peter’s first epistle again form my own opinion and I have to say at first blush, the intended readership of the letter could go either way. That is, it could be to a group of Jesus-believing Jews in the diaspora who were being tempted or who had come from a past life of “excesses” in Greek living (Zetterholm wrote extensively on this), or to a group of Gentile Jesus-believers who came out of paganism and were being tempted to return to some of their old practices. One thing that might support Paul’s audience being Jewish and being historically less than scrupulous in their Torah observance is that, as Derek Leman and David Matthews wrote, “Paul was too Jewish for the Synagogue”. In other words, Leman and Matthews suggest that some, perhaps many Jews in the diaspora were not adhering to the same level of observance and piety as their counterparts in Israel. As I read them, they may also be saying that a life of devotion to Messiah for the first century Jew required a greater degree of Torah observance than might otherwise be expected. Thus Peter may have been attempting to counter this tendency by addressing it with his Jewish readers in the various believing communities/synagogues in Aisa Minor. It is true as PL says, that typically Christian commentators consider the audience of 1 Peter to be either Gentile Christians or a general or mixed group of Jews and Gentiles but I found one Christian writer who believes Peter’s letter is addressed to Messianic Jews, in spite of all of the so-called support in the Church for the readers being Gentiles. I think Peter wrote to Jewish Christians who had been born again (compare John 3:3-5 and James 1:18 with 1 Peter 1:18—2:1)? They might have been, as many scholars have suggested, recently baptized believers who have “now” turned to Jesus Christ. If in their past they had been going along with the Gentiles those days are definitively gone and none too soon. I think his use of Old Testament categories to describe them is right on target since these Jewish believers are the true Israel (compare Romans 9:6-7) because they received the Messiah as the precious cornerstone. They are contrasted with their leaders who rejected Christ (1 Peter 2:6-8 and Acts 4:10-11 where Peter uses the same text to the Jewish leaders). And it was the same Peter who in Acts 3:22-23 quotes Deuteronomy 18:15-19 saying that those who reject the coming Prophet will be “cut off from among the people.” Peter, like Paul, sees the true Israel as those who rejoice in Jesus Christ as the Messiah. The rest are cut off from among “the people”. That is, they are not classed as part of the true People of God. When he likens their suffering to the suffering of the Servant Christ from Isaiah 53 could he not be including them with the concept of the “servant” as Paul certainly did in Acts 13:47 (the Lord commanded “us”)? Might that notion not be strengthened by Peter’s remark in 4:13 that their sufferings are “the suffering of Christ”? Finally, in 4:3 Peter contrasts his readers with Gentiles. In light of 1:1 that should lead us to think they are Jewish. Michaels confesses that this is “striking” and goes on to speak of Peter’s “strong conviction that his Gentile Christian readers are actually Jews in God’s sight.” So why not allow them to actually be Jews? Admittedly, this letter is more nuanced than I previously thought. Of course assimilation has occurred many times in Israel’s history and this teaches us that assimilation eventually leads to a complete loss of Jewish identity. It’s an established sociological fact that the whole process of assimilation, beginning with cultural assimilation then structural assimilation then marital assimilation and finally identificational assimilation, takes three or four generations. If, as you propose, the intended Jewish audience of 1 Peter was in the process of assimilation, Hellenized yet still identifying as Jewish, then this audience would have had at least one BUT NOT MORE THAN three or four preceding generations who were also Hellenized to some degree. But the previous three or four generations of ancestry that would’ve been Hellenized would constitute but the smallest fraction of Jewish ancestry for a first-century Jew. A first-century Jew would’ve had close to TWO THOUSAND YEARS of Jewish ancestry. And even a Hellenized Jew, to still be identifying as Jewish at all, would know about this two thousand year history, that his ancestors were known for keeping Torah and Tradition for close to two thousand years. He would associate his ancestors with Torah-keeping, not paganism–because to be Jewish means to any rational person to be a product of thousands of years of Judaism. So then your argument is that Peter the Apostle, knowing full well how a first-century Jew identifies with his two thousand year ancestry, nevertheless called the ancestral religion of his Jewish audience an “empty way of life”? @Peter — I’m afraid your attempt at a mathematical analysis of assimilation among Hellenists in the period from the second century BCE to the first century CE is somewhat flawed. Assimilation is never quite that neat, neither then nor in the past couple of centuries since the Enlightenment and the rise of Reform Judaism. There are several modern forms of Judaism that preserve some degree of Jewish religion as well as of Jewish culture, and we should not likewise not neglect the degree of Jewish culture and identity that has been retained within forms of Hebrew-Christianity. Further, there are some families descended from Anusim that still retain some limited touchstones of Jewish identity memory even 500 years after the expulsion from Spain and the subsequent Inquisitions and forced conversions. The losses from Judaism to assimilation can leave some long-lasting traces. We should not be surprised if some similar social dynamics existed after the return from Babylonian exile and after the Alexandrian Seleucid conquests, leading us to the events of Hanukah, the Maccabean period, the subsequent Hyrcanean kings, and then Roman hegemony. The Hellenists were a legacy from the Maccabean period, and persisted sufficiently to produce family situations like that of Rav Shaul’s protégé Timothy, whose mother was Jewish and father was Greek and whom Shaul circumcised as an adult in preparation for his ministry among fellow Jews. So the suggestion that Peter’s first letter might have been addressing assimilated Jews in the diaspora in its reference to a former empty way of life is not an outrageous one. One might say something similar from a modern orthodox messianic Jewish perspective to some of the modern assimilated Jewish Christians or Hebrew-Christians, regardless of whether they might mistakenly be calling themselves by the label “Messianic Jews” without having really embraced that paradigm. Hi James. Not having English as my first language, what does “snarky” means? Thank you for answering my question. I appreciate the information. If you asked any first-century Jew, “What is the ancestral religion of the Jews?”, would he not immediately respond “Judaism!” He wouldn’t even hesitate because it is a well known fact that Jews have practiced Judaism for thousands of years. And this response wouldn’t change even if some of his more immediate relatives were culturally assimilated. Judaism is the ancestral religion of the Jews. And this, whether or not you want to dispute the sociology of assimilation, is not disputed. And so if Peter, as you say, was writing to a Jewish audience then what can we make of the fact that Peter calls the ancestral religion of Jews an “empty way of life”? Yes, you can certainly contend that the intended addressees of 1 Peter were exclusively Jewish but if you make that contention then you are also making Peter the Apostle out to be either an anti-Judaic Jew or a complete imbecile who would flunk Communication 101. Analysis of intended addressees must take into account how first-century Jews would perceive the letter, don’t you agree? So please explain to me, Proclaim Liberty, how you would resolve this glaring flaw in your analysis. I can quickly see this debate degenerating into a spitting context, gentlemen. Please keep in mind that in spite of our differences, we all serve the same King and will have to give an accounting for every word and deed we commit in this lifetime. It’s quite simple, Peter — First-century Jews would not have recognized a term like “Judaism” at all, because the term wasn’t formulated until centuries later to distinguish it from the competing claims of the religion known as “Christianity”. Jews were “Israelites”, that is, a national or ethnic identity rather than a religious label. The finer distinctions of affiliation or disaffection were represented by other names representing viewpoints or factions, such as Pharisee, Sadducee, Essene, Zealot, Hellenist, and the like. Shimon Petros didn’t address such details in his first or second letters, and he did not express an anti-Jewish viewpoint but rather an in-house critical challenge. As I mentioned in my last post, a modern Jewish messianist could offer similar criticism of a modern assimilated Jewish lifestyle. Jews have a long history of arguing with one another over such issues, and the terminology we use with one another within our community is understood differently than how outsiders might interpret it. This is one reason why Christians have so often misunderstood and exaggerated the meaning of the polemics expressed by Rav Yeshua or by Rav Shaul; and here perhaps we see it also with Peter. This also must be taken into account while trying to interpret how Shimon Petros was to be understood by his readers. I highly recommend reading the whole article. I think it’s too long to quote it all (as you did too). And there is much scripture referred to outside of the writing or speaking of Peter. It is a disagreement, in thought-out detail, with a stance by a person named Michaels (a person who thinks it was written to gentiles — and who thus has to conclude, Michaels does, that believing gentiles are Jews to God… replacement theology). It goes piece by piece, bringing in Bible and comparison. It’s quite good, although not perfect, about as good as can be hoped for… it really is worth the time to study or read. Cummings’ perspective is largely that there has to be great reason not to take the opening as is, and he doesn’t find any reason to discount the opening and shows why. This is the ending, but I’d say the meat of the subject goes before. I added emphasis of my own and didn’t try replicating original italics. Mr. Jim McGuiggan, that is. Actually, that’s not true at all. Going back to the Septuagint version of Esther 8:17, Jews were using terms like “ioudaizon”. Paul uses the term “Judaism” in Gal. 1:13-14 (i.e.”ioudaismos”) and uses a variant in Gal. 2:14 “ioudaismos.” So the Greek source word for “Judaism” was well- established in first-century. In the end, we’ll leave it to the readers of these comments to decide which position carries the most persuasive evidence. I’ve enjoyed this dialogue with you and hope we can dialogue further in the future on other matters. Maybe that “ancestral religion” had leaned far too much towards “tradition” rather than towards Torah. Jesus had said “for the sake of your tradition you have made void the word of God”. Also how often was Jesus opposed and criticised because of things He did on the Sabbath? And how many of those things WERE actually breaking Sabbath as per the law, in contrast to man’s traditions about what could not be done on the Sabbath? If tradition was replacing or overruling Torah in the lives of some Jews, then surely it WOULD be an “empty way of life”. We can get so caught up in what Paul or Peter (or whoever wrote letters) were trying to say that the actual stories in the gospels get forgotten; the stories (real things that happened, not just children’s tales) — and the words of J’shua. Like the stories in the gospels and stories in the prophets before, along with the words communicated from God, some most basic and profound and central lessons can recede from view (or even never be grasped). J’shua warning about tradition can be taken as passing words not rooted in factual living. It’s not that tradition is bad, it’s that it was too bad (as J’shua observed). At the Jim McGuiggan link, it is problematic that Israel is referred to as Palestine with regard to Peter’s letter. It is anachronistic for their time. But I know it is or perceive it as “old-school” terminology. Eusebius, too, is an less-than-stellar mention in terms of history (as newer scholarship shows he wasn’t a trustworthy historian). What suggests that they are Gentiles? I had just come across that “Reflection” (article) before I posted it, noticing James had as well. The author’s next article he links to at the end might be of interest to some to see a certain point of view (one that syncs with calling the Jews he’s discussing “Jewish Christians” even though that’s not really the same thing as Messianic). I don’t believe a Jewish person has to be Christian or believe in J’shua to be of true Israel (but do believe rejecting him like the leaders did is different from not believing in him, or is an amplified magnitude). Anyway, to those especially who got disturbed Peter might possibly be seen as speaking to Jewish people (while, of course, it wasn’t good for gentiles to behave as the gentiles of the time either), take a look at J. Ramsey Michaels’ ideas of why he thought it had to be gentiles. Thanks, Jos. I replied on your blog.